A simple guide on installing memory ram using SPD, JEDEC and XMP when performing a ram upgrade using ram sticks and upgrading pcram and ram for computer. Most people can figure out how to install RAM sticks into their computer. If you don’t there’s a tutorial here. In short, make sure everything is off and then install the sticks to take advantage of the multiple channels on offer. Your motherboard manual will tell you which slots to put the sticks in to do this. The reason is simply that two sticks operating along two channels is faster than two sticks operating along the same channel. That’s all. But once it’s plugged in, then what? SDP, JEDEC, XMP and WTF? Well you can just leave it and it should work thanks to complex-sounding acronyms provided by JEDEC called SDP. 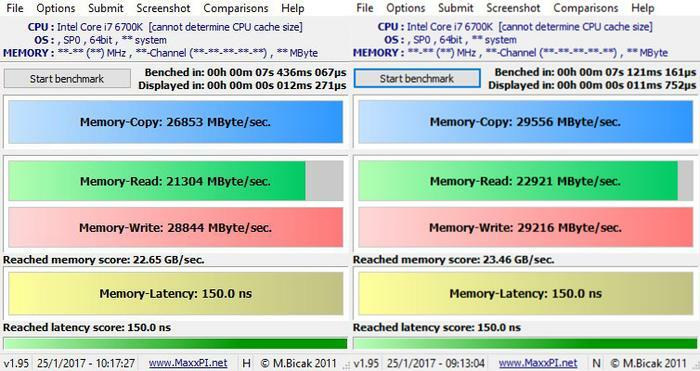 But all this means is that memory association, JEDEC, designed a standard called Serial Presence Detect (SPD), which tells every modern computer which settings freshly-installed memory should use by default. But if you’ve spent money on some fancy, fast memory then you need to activate one setting to get it running at its optimum levels – not default levels. We’re not talking about complex overclocking here but there’s no point buying a Ferrari and only driving it around in second gear. The setting is called XMP and it stands for Xtreme Memory Profile. It offers more-sophisticated memory tuning than the general, default SPD values. 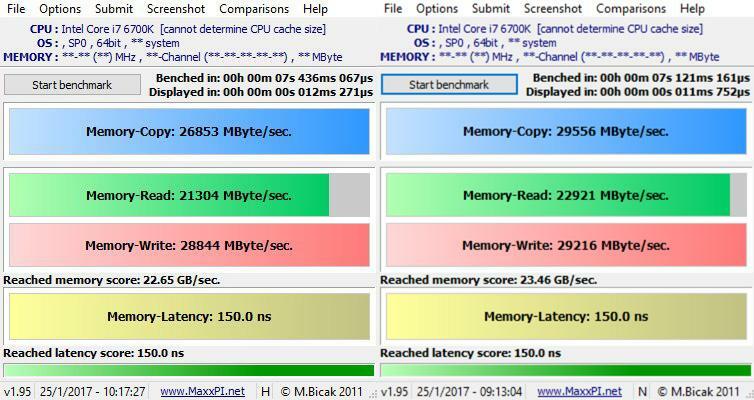 Every RAM stick has its own timing and voltage values and you can see them on the side of each stick (memory kits should have the same settings which is why it’s not a great idea to install different kits – they’ll likely have different settings - although you can set the timings to match, manually. 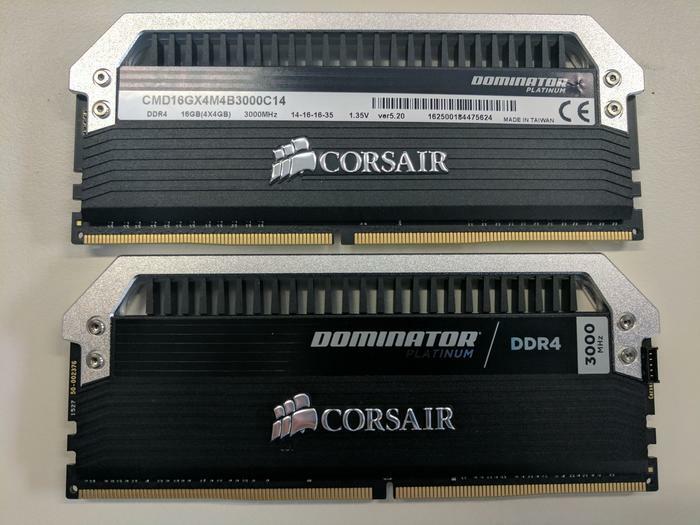 You can see the recommended timings and voltage of a memory kit on the side of these Corsair Dominator RAM sticks. You could enter all this manually or simply select XMP Profile 1 on the motherboard BIOS/UEFI settings. With XMP disabled our Corsair Vengeance RAM runs at a default 2133MHz. 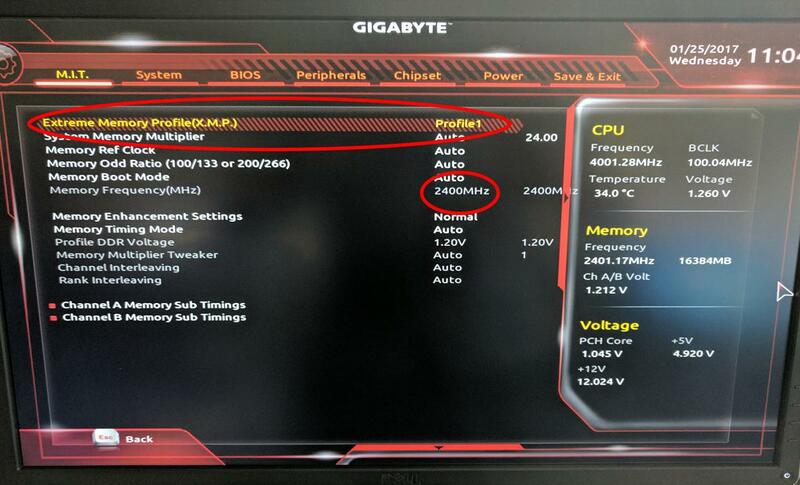 With XMP enabled the Corsair Vengeance RAM now runs at the 2400MHz that is on the label. 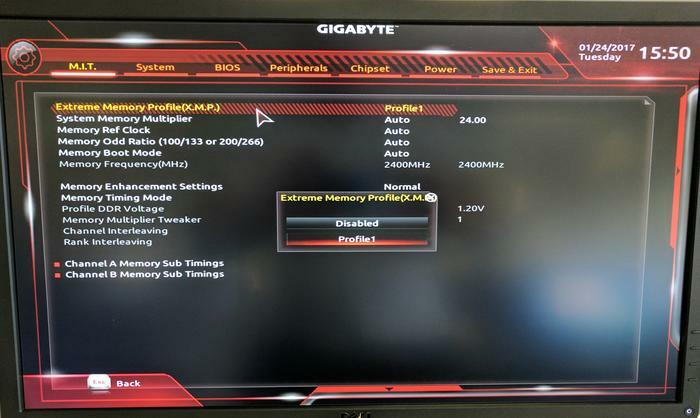 If you’ve a recent motherboard and fancy new RAM then it will come with an XMP profile. This is different to the older SPD standard JEDEC profile which assigns default speeds to certain types of RAM. An XMP profile will get it running at higher speeds than default. 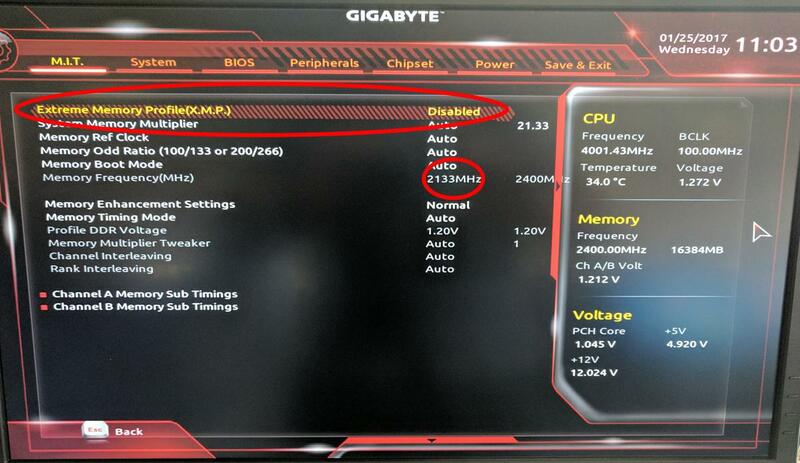 First, enter your motherboard’s BIOS and look for XMP - it is usually set to off or disabled by default. Simply change this setting to Profile 1. That’s all you need to do. XMP is usually disabled by default. Turn it on to get the best out of your RAM sticks. If you’re a curious type, you can look at the memory settings, timings and voltages in the BIOS and see that they now match the labels on the side of the RAM sticks. You can also see these settings listed in the program called CPU-z under the Memory tab. Some people manually tinker with these settings to get even more speed appearing – a process called overclocking - but do not do this if you don’t know what you’re doing as you could break your computer. Manual tweaks like this only show up in specialist, synthetic benchmarks anyway (there’s rarely any real world difference) and overclockers only do this to compete with each other. While you won't see big differences in the real world, simply switching from default (SPD) memory settings (left) to optimised (XMP) settings (right) will bring you some gains as you can see with this Corsair Vengeance LPX DDR4 RAM.